A great carry round for personal defense! 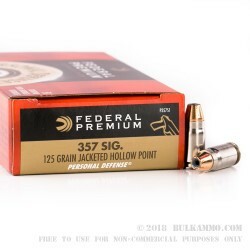 These Federal .357 SIG JHP ammo has fantastic stopping power for any concealed or open carry circumstance. Federal is a company that is chosen time and time again by law enforcement and civilians alike. Not to be confused with the .357 Magnum, the .357 SIG was first introduced in 1994. Despite the similarity in name, they are truly completely different rounds. Magnum rounds are longer versions of the .38 special, which were standard caliber for police back in the day. 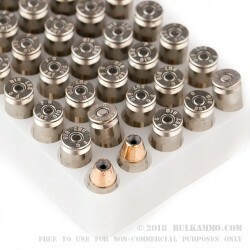 SIG rounds are shorter and wider, necked with a .40 case and 9mm bullet. So, needless to say, they are NOT interchangeable! 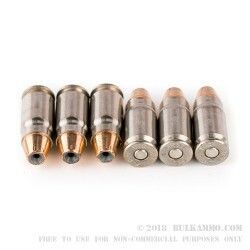 These rounds are brand new, reloadable, non-corrosive, nickel-plated brass and boxer-primed with a muzzle velocity of 1350 fps. 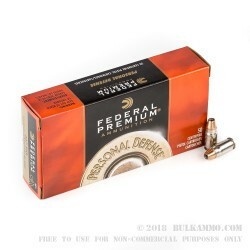 They feature Federal’s Hydra-Shok notched copper bullets and their center-post hollow point design that initiates and controls expansion. Federal is world renown for their reliable products and have kept their head in the game when it comes to modern advancements. Owned by Alliant Techsystems, Inc (ATK), Federal is also the parent brand of Federal American Eagle and Federal Premium.